Ever since I saw the first two movies in the Evil Dead franchise, I've been a big Bruce Campbell fan. I'm still a little bit upset he came to Comic Con in Nashville and I didn't know about it. Maybe we will one day. The pick for this week is a movie I saw in an independent theater, back in my home town of Columbia, SC while I was in college The place even sold Blenheim Ginger Ale, which is my favorite soft drink, just ahead of McDonald's Coke (they store theirs in tanks, instead of using syrup, so it's much better). 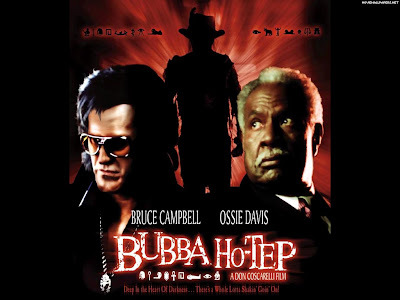 But the movie this week is Bubba Ho-Tep, which stars Campbell, as Elvis Presley, who now lives in a nursing home. So no, Elvis didn't really die. The real Elvis temporarily switched places with an Elvis impersonator and the fake Elvis died as the real Elvis. So you think the real Elvis could have just taken on his role again and shown his documentation? Wrong, all of the proof was destroyed in an explosion Confusing, I know. The movie also stars Ossie Davis, who believes he is JFK and says that after the assassination, he was patched up, dyed black and ldropped off at a senior home by LBJ. 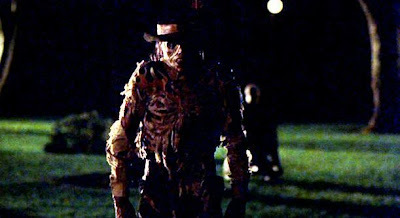 Life is good in the nursing home until an ancient Egyptian demon takes residence in the nursing homed, donned in cowboy gear and goes after the souls of the old people. Why old people? Well, they are slow and the demon isn't exactly in his prime. The demon is wreaking havoc in the nursing home as he swallows the souls of Elvis' and JFK's(?) friends. It's up to the duo to destroy the Egyptian cowboy mummy demon and release the souls of all the recently departed old people so they can go to their final resting place. Now that's a story line.